In Matthew 21:19-46, Jesus tells two parables. The meaning of the symbols in Jesus’ parables is consistent throughout the Gospels. These two parables convey similar prophetic messages concerning Israel’s immediate and distant future. The meaning and fulfillment of these parables is explained in the following Preterist commentary on Matthew 21:19-46. The following may seem unbelievable. However, all information is taken from unbiased historical records and is easily verifiable. Sources listed at the end. The miracle of the withering of the fig tree in Matthew 21:19 foreshadows the desolation of Jerusalem which this tree outside Jerusalem represents. 19Seeing a fig tree by the road, he went up to it but found nothing on it except leaves. Then he said to it, “May you never bear fruit again!” Immediately the tree withered. A Preterist Commentary on Matthew 21:19: The Fig Tree Represents Jerusalem which was soon to be destroyed by the Romans because of its wickedness. 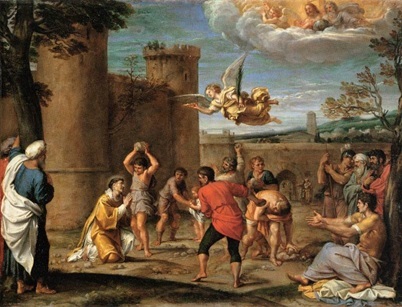 The wickedness of Jerusalem is exemplified by the stoning of Stephen and the subsequent persecution of Christians in Israel in the first century. Cities are called “mountains” throughout the Bible. The “mountain” of Matthew 21:21 is probably Jerusalem. A Preterist Commentary on Matthew 21:21: The Mountain in v. 21 is Jerusalem and the Sea symbolizes the Gentile Nations. Therefore, the Casting of the Mountain into the Sea represents the Conquest of Jerusalem by the Roman Army during the Jewish War. Mountains are also often used in the Bible to represent cities since ancient cities were often built atop mountains for military defense (Psalms 2:6; 48:1; Isaiah 66:20; Jeremiah 51:25; Joel 3:17). 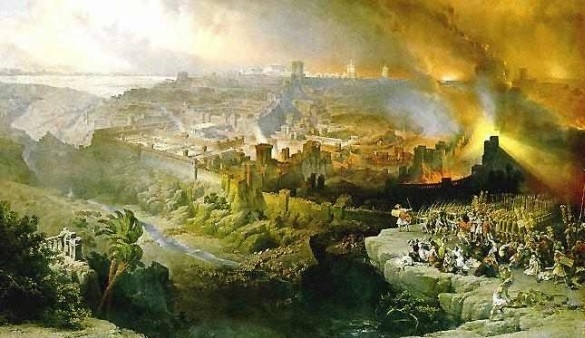 The mountain in this parable like the fig tree that withered represents the city of Jerusalem, God’s holy mountain: “[L]et now Your anger and Your wrath turn away from Your city Jerusalem, Your holy mountain (Daniel 9:16)[. ]” Sea is another common Biblical symbol. Sea represents the Gentile nations (Daniel 7:2-3; Revelation 17:15; Psalm 65:7; 144:7; Isaiah 8:7-8; 17:12; 60:5; Jeremiah 47:1-2; 51:55-56; Ezekiel 26:3). When a foreign army was expected to conquer a kingdom the prophets frequently portrayed this foreign army as mighty flood waters overcoming the city of God’s wrath. One prominent example of this symbolism among many is found in Isaiah 8:7-8: “Therefore the Lord is about to bring against them the mighty floodwaters of the Euphrates—the king of Assyria with all his pomp. It will overflow all its channels, run over all its banks and sweep on into Judah, swirling over it, passing through it and reaching up to the neck.” Foreign nations and their armies are often clearly represented by the sea or flood waters throughout the Bible (Isaiah 17:12; 60:5; Jeremiah 46:7-8; 47:1-2; 51:55-56; Ezekiel 26:3; Daniel 11:10; 11:40) (see In the Bible “Earth” Signifies the Specific Land Addressed While “Sea” Symbolizes Foreign Nations). Thus the casting of the mountain of Jerusalem into the sea in v. 21 was prophetically fulfilled in the Roman conquest of Jerusalem in A.D. 70. Given the fact that sea or waters is a common Biblical symbol of Gentile nations (Psalm 144:7; Isaiah 17:12; Revelation 17:15), it is interesting to note that after the fall of Jerusalem in A.D. 70, many Israelites were exiled throughout the Roman Empire, the sea.2 There many Jews were enslaved and killed in public spectacle. The casting of the mountain or city into the sea could also be said to represent, in part, the subsequent exile of the people of Jerusalem throughout Gentile Rome, the sea, after the Roman conquest of Jerusalem in A.D. 70. “Sea” is a Biblical symbol for the Gentile nations. The casting of the mountain of Jerusalem to the sea was fulfilled during the exile of the people of Jerusalem to the Gentile Rome after the Jewish War. A Preterist Commentary on Matthew 21:21: The Sea also represents the Abyss, the Realm of the Dead. Therefore, the Casting of the Mountain, Jerusalem, into the Sea also represents the Slaughter of the People of Jerusalem during the Jewish War. Sea has another, deeper meaning in the Bible. The sea is the Abyss, the realm of the dead. The hurling of a mountain or city into the sea or Abyss is a symbolic expression of the destruction of a city and the slaughter of its inhabitants. 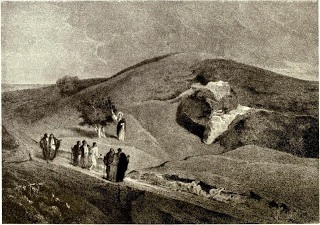 The casting of the mountain into the sea in this parable points to the destruction of Jerusalem and the massacre of its people in A.D. 70 (see The Poetic Biblical Link Between “Sea” and “Abyss”). “Sea” also represents the Abyss, the realm of the dead. 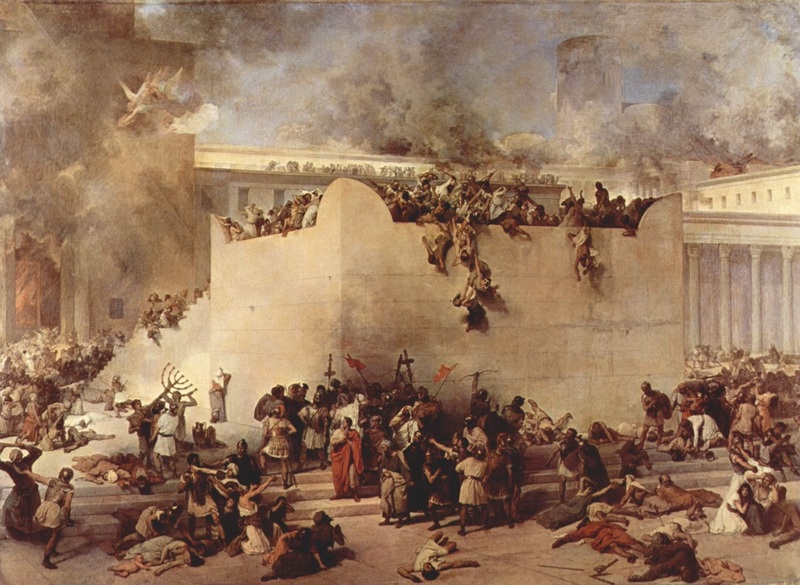 Thus, the casting of the mountain of Jerusalem into the sea in Matthew 21:21 was also fulfilled in the massacre in Jerusalem during the Jewish War. A Preterist Commentary on Matthew 21:21-22: God answered the Prayers of the Saints, and the Mountain was thrown into the Sea. According to Revelation 6:9-11, the plagues of Revelation and their fulfillment during the time of the Jewish War were ultimately a consequence of the prayers of the saints. After Jesus’ crucifixion, many Christians in Israel were murdered by their Jewish brethren.3 God answered their pleas for justice in A.D. 66 at the start of Israel’s war with Rome. 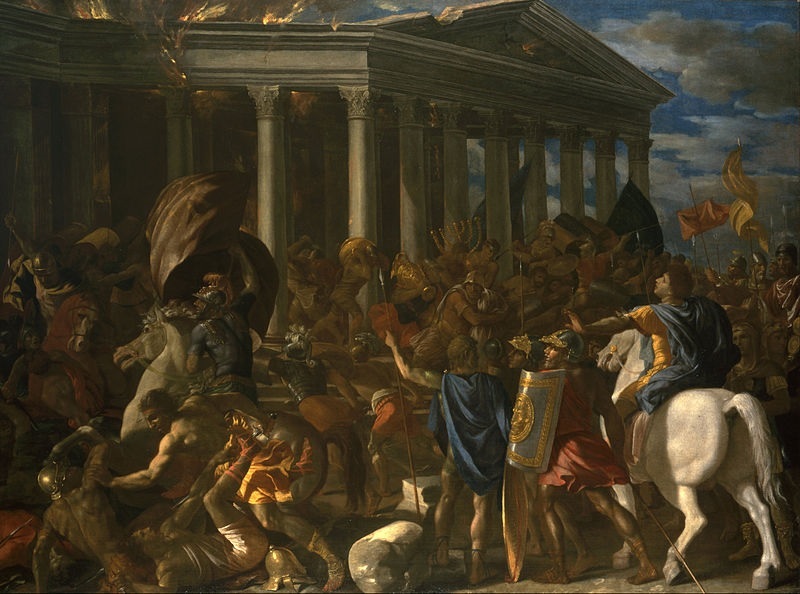 During this war, Israel was destroyed by the Roman army. And many Israelites were killed and exiled. Jesus was right. As a result of the faith of the saints, the mountains of Israel had metaphorically been thrown into the sea. 33“Listen to another parable: There was a landowner who planted a vineyard. He put a wall around it, dug a winepress in it and built a watchtower. Then he rented the vineyard to some farmers and went away on a journey. 34When the harvest time approached, he sent his servants to the tenants to collect his fruit. 35“The tenants seized his servants; they beat one, killed another, and stoned a third. 36Then he sent other servants to them, more than the first time, and the tenants treated them the same way. 37Last of all, he sent his son to them. ‘They will respect my son,’ he said. 38“But when the tenants saw the son, they said to each other, ‘This is the heir. Come, let’s kill him and take his inheritance.’ 39So they took him and threw him out of the vineyard and killed him. 40“Therefore, when the owner of the vineyard comes, what will he do to those tenants?” 41“He will bring those wretches to a wretched end,” they replied, “and he will rent the vineyard to other tenants, who will give him his share of the crop at harvest time.” 42Jesus said to them, “Have you never read in the Scriptures: ” ‘The stone the builders rejected has become the capstone; the Lord has done this, and it is marvelous in our eyes?’ 43“Therefore I tell you that the kingdom of God will be taken away from you and given to a people who will produce its fruit. A Preterist Commentary on Matthew 21:33-43: The Meaning of the Symbols in Jesus’ Parables is consistent throughout the Gospels. The meaning of the symbols within Jesus’ parables remains fairly consistent throughout the four Gospels. The landowner is God or the divine Messiah; the vineyard is a city or kingdom, in this parable it represents Jerusalem;4 the tenants or farmers are the Jewish authorities, specifically the elders, chief priests and Pharisees; the landowner’s servants are apostles, saints and prophets; the fruit of the harvest are virtuous saints; and the harvest, as is the case in Matthew 13:39, is the end of the age. 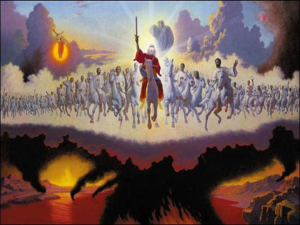 The second coming according to Revelation 19. 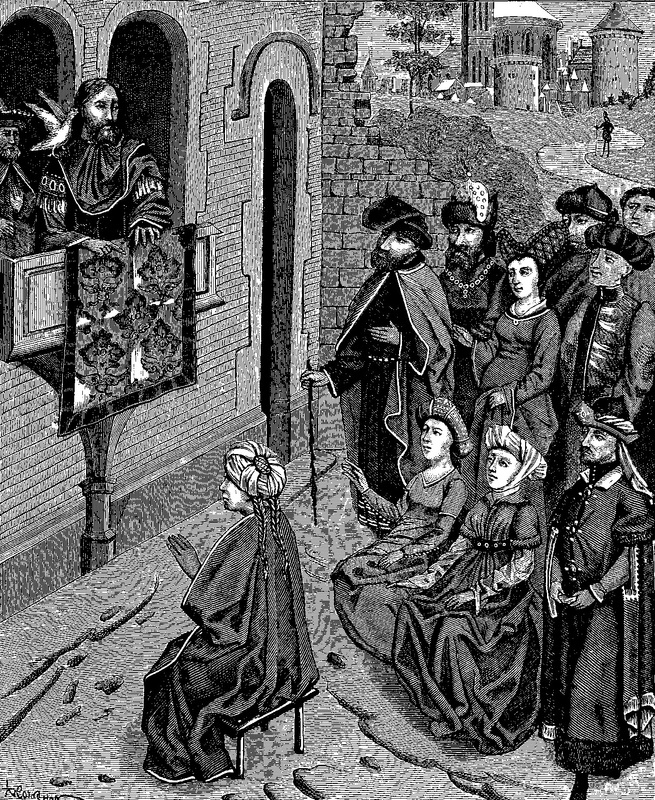 A Preterist Commentary on Matthew 21:33-43: The Deaths of the Saints, the Death of Christ, the Second Coming, the Jewish War and the Conversion of Israel . . . Seeing a land unfruitful in virtue, God, the landowner, sent His servants, the prophets, to warn Jerusalem, the vineyard, to repent or face disaster. Ignoring these prophetic warnings, the tenants representing the Jewish authorities stoned, beat and killed these prophets. Then God sent His son to teach repentance and warn of the coming war with Rome. Verse 38 hints upon and vs. 45-46 seem to confirm the horrifying motive underlying Jesus’ murder. Because Jesus publically denounced their wickedness throughout His ministry, the chief priests and Pharisees feared that they would lose their positions of power in Jerusalem if Jesus became king of the Jews. As is strongly suggested in vs. 45-46 the Jewish authorities fearing that they would lose their jobs or perhaps even their lives plotted to have Jesus killed after hearing this parable so that they could continue to reign over Jesus’ inheritance, the vineyard representing Jerusalem in this parable. Then in fulfillment of v. 39, Jesus was taken outside of Jerusalem, the vineyard, and crucified. After His resurrection, Jesus was seated at the right hand of the Father. Having received the Father’s kingdom, Jesus then became the landowner. For a much more detailed explanation of why the Bible suggests that the Jewish authorities sought to have Jesus killed in order to preserve their positions of authority in Jerusalem and Israel from a potential Messiah who was overtly hostile toward them and how this motive was directly linked to the mark of the beat (see Revelation 13: A Preterist Commentary). After the expulsion of the Jews after the Jewish War and the subsequent Bar Kokhba Rebellion, Israel grew to become a Christian nation for a thousand years until the Crusades fulfilling Matthew 21:43. 44He who falls on this stone will be broken to pieces, but he on whom it falls will be crushed.” 45When the chief priests and the Pharisees heard Jesus’ parables, they knew he was talking about them. 46They looked for a way to arrest him, but they were afraid of the crowd because the people held that he was a prophet. 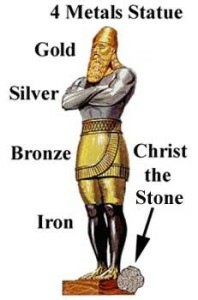 The stone of Matthew 21:44 is the stone that shatters the feet of the statue in Daniel 2. This stone is Christ. A Preterist Commentary on Matthew 21:44: Verse 44 is an Allusion to Daniel 2:34. In v. 44 Jesus refers to Himself as the stone in Daniel 2:34. In this verse, a rock representing Jesus strikes the feet of a statue signifying Rome. 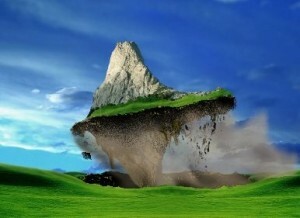 The rock shatters the statue and then grows to become a large mountain. This mountain is the kingdom of God. In Matthew 21:19-46: A Preterist Commentary, the meaning and fulfillment of two parables with similar prophetic messages concerning Israel’s future were explained above. The fertilization of the fig tree in this parable represents Jesus’ ministry in Israel. Despite the wonders Jesus performed in conjunction with His message, most Israelites did not repent. Josephus The Wars of the Jews 6.9.3. Eusebius The History of the Church 3.5. It also represents Israel and all of creation. Matthew 21:41 reads, “’He will bring those wretches to a wretched end,’ they replied, ‘and he will rent the vineyard to other tenants [husbandmen], who will give him his share of the crop at harvest time.’” The Greek word translated tenants in v. 41 is more accurately translated husbandmen or farmers. Here the new Christian occupants that replaced the Jewish inhabitants of Jerusalem shortly after the Jewish War and subsequent Bar Kokhba rebellion are symbolized as husbandmen or farmers. It is interesting to note that Jesus the son of Ananus who is identified as the two witnesses in the commentary on Revelation 11 was a husbandman or farmer. In the commentary on Revelation 11 a case is presented suggesting that the two witnesses are Jesus Christ. Was Jesus the son of Ananus Jesus Christ in the flesh? Of course, one can never know for sure. But if he was then the fact that he returned in the flesh at the time of the Jewish War as a husbandmen may point to the impending fulfillment of this parable. In 1 Corinthians 12:27 Christians are called the Body of Christ. If the Christian church is the body of Christ and Christ came back as a farmer during the Jewish War, it is easy to see how Jesus’ followers might also be symbolically considered farmers as well in fulfillment of Matthew 21:41. John said to Israel: „O generation of vipers, who hath warned you to flee from the wrath to come? Bring forth therefore fruits meet for repentance (…) And now also the axe is laid unto the root of the trees: therefore every tree which bringeth not forth good fruit is hewn down, and cast into the fire (Mat3,8-10). So Jesus felt sadness for the destiny of Israel and Jerusalem and said to the women on his way to the cross: „Daughters of Jerusalem, weep not for me, but weep for yourselves, and for your children.“ The wrath will come soon and bad things will happen to them: „For if they do these things in a green tree, what shall be done in the dry?“ The coming fire and sufferings will even damage the green tree, that naturally resists the fire. But what will happen to the dry three, that attracts it?